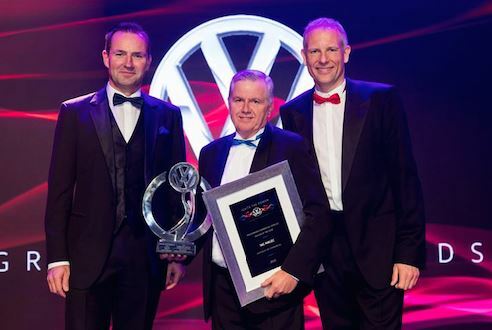 Barons Pietermaritzburg has been named the 2015 Volkswagen Dealer of the Year, its second consecutive honour as the best performing dealership in the Volkswagen network. Speaking at the annual Volkswagen dealer awards gala dinner hosted in Johannesburg recently, the Chairman and Managing of the Volkswagen Group South Africa, Thomas Schaefer said: "The sustained success of Volkswagen in the passenger car market in South Africa comes from the dedication and diligent work of our dealership network which I am convinced is the best in the country. After a rocky and challenging start in 2015, each one of you put their shoulders against the wheel to ensure that we finished the year on the high to become the passenger car market leader for the fifth consecutive year." Schaefer added: "The declining sales in the first quarter have given us an indication that 2016 will be another tough year for the local car market. This will be exacerbated by the weakening currency and uncertain socio-political outlook. We however, remain positive that the strength of our brand and your ingenuity will carry us through the year." Each year, the 106 Volkswagen dealerships are set targets across various disciplines of the business. The targets include sales volumes and customer service delivery. The "Dealer of the Year" award is presented to a dealership that excels in all major disciplines of the business. The top performing dealerships are invited into the "Volkswagen Club of Excellence", where the overall best performer is awarded with the "Dealer of the Year" status. Kevin Pillay, Dealer Principal at Barons Volkswagen Pietermaritzburg until October 2015 said: "We are honoured and proud to win the Dealer of the Year award for the second consecutive year. This is a fantastic achievement for our team and a massive recognition to the work of our employees." Pillay's successor Keith Abrahams added: "Our team set a target of doing it again in 2015 after we were presented with the award for our sterling work in 2014. The togetherness and drive to delight our customers have been the recipe of our success in the past year. We will strive to continue with this attitude to ensure that we remain one of the best dealerships in the Volkswagen network." Kevin Pillay is now the dealer principal of Barons Volkswagen Culemborg in Cape Town. Volkswagen Commercial Vehicles Dealer of the Year award was presented to Hatfield Volkswagen Commercial Vehicles for the second straight year. The Dealer Macro Group of the Year was presented to Barloworld Group and Dealer Micro Group of the Year went to Hatfield Group. Both Groups were recognised with the awards for the second year in a row.